Nope. You won’t see the little drummer boy that you are used to seeing around this time of the year in that picture. You know how some technophobes (and even technophiles) say that people will one day be replaced by machines? Well, this is a great example of how that is totally possible. YouTube user bd594 apparently had some time on his hands, so he decided to tinker around with an HP scanner – the flatbed kind, obviously, a snare drum, and some other electronic items. His masterpiece? 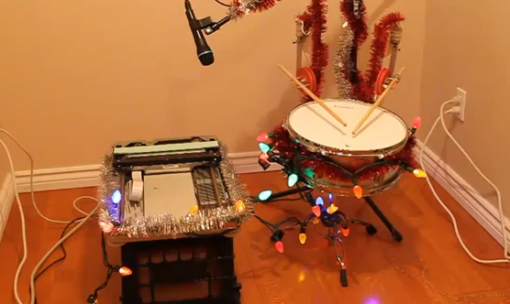 A two-gadget band rendering its own version of the Little Drummer Boy. Yes, that ubiquitous piece of Christmas music that I am pretty sure you have gotten enough of by this time.